The transition from eighth grade to high school is tough for a lot of students, but at least this year's bunch of Wood Middle School eighth-graders will be welcomed by a familiar face when they start at Wilsonville High School in the fall: their principal, Kelly Schmidt. The West Linn-Wilsonville School District announced Jan. 28 that Schmidt had been hired as the new WHS principal for the 2019-20 school year, following current WHS Principal Dan Schumaker's retirement. "We look forward to Ms. Schmidt's transition to Wilsonville High School, where she will build on the great work that Principal Schumaker has helped foster in recent years," Superintendent Kathy Ludwig said in a press release. "The many successes she has helped to create at Wood Middle School will serve the entire Wilsonville community as we embark on this new chapter in the West Linn-Wilsonville School District." 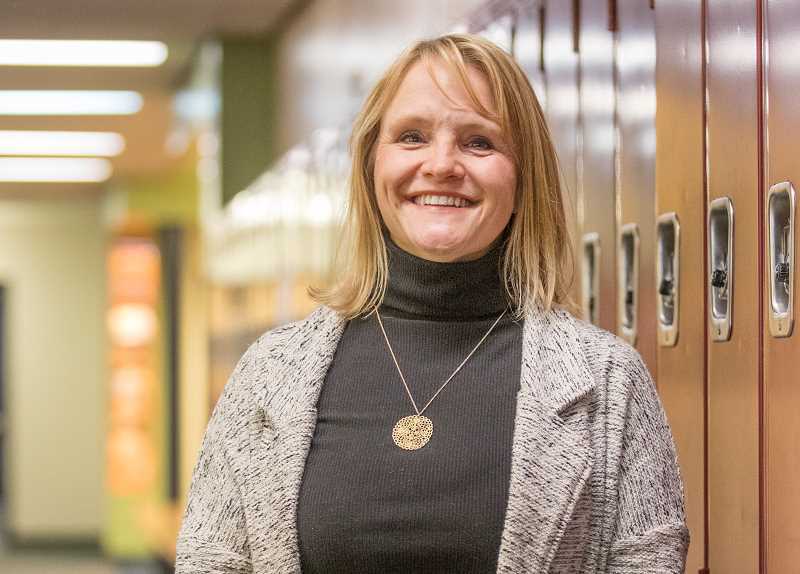 Schmidt, who has served as the principal at Wood for the past two years, got her start in teaching in the Oregon City School District after earning her master's degree in health education. After initially studying public health in college, a desire to give back to her community motivated her to go into education. "I strongly remember the powerful impact that educators had on me throughout my education and I was pretty compelled to give back to the community," Schmidt said. "It runs deep in my roots and so being service-minded is just part of who I am." Schmidt started at Wood two years ago during a critical period for the school. Meridian Creek Middle School had just opened and took about a third of Wood's teachers and an equally large chunk of students. Schmidt saw the challenge of the transition as an opportunity for the school to change in a positive way. "There's a lot of grief associated with losing a colleague and teams of teachers leaving, students whose friendship groups change," Schmidt said. "When you have a big change like that, there's a lot to work through but I also think those are the things that have made it so wonderful and great for our community. We're smaller. The school being smaller was just the right time for the community and I think it's made it a better place." In just two years at Wood, Schmidt has developed a love for the school, its staff and students that will make it difficult to leave. "I've loved my time here," she said. "This is a great school. These are great, great kids. The parents have been amazing and supportive. I'm so proud of these teachers. They inspire me every day." But knowing she will see the kids again when they come to WHS makes it a lot easier. "The idea of moving on to the high school level in the same community with a lot of the same kids and families was a really strong appeal for this position," Schmidt said. Just as when she came into Wood, Schmidt will start at WHS during a significant period. But rather than being cut down in size, WHS is growing rapidly. WHS is projected to grow by around 500 students in the next 10 years. Again, Schmidt sees these changes as an opportunity as well as a challenge. "It is also an opportunity for us to think about expanding programs, different opportunities for kids," she said. "I want us to be really thoughtful about how we take the great, amazing things that are already happening and continue to expand opportunities but also hold on to those things that are already great successes." Schmidt had nothing but praise for WHS, its staff, students and programs. "They're doing amazing things there already and so I'm super excited to be a part of that, to learn from them, to lead alongside them," she said. "I couldn't have asked for a better high school. I'm humbled and honored to be able to go to that high school." Working at a school for which she has so much respect is not something Schmidt takes lightly. She does not underestimate how critical a life juncture high school can be. "As a school leader, I have a great responsibility to our students and to helping each student have the opportunity to use their high school experience, to see their future forward, to see that path," Schmidt said. "I have a great heart and feel this strong moral obligation to our underrepresented students or students who maybe traditionally haven't experienced success." She is more than excited to do this important work at a school like WHS. The search for a new principal at Wood is already underway.